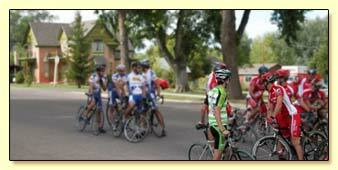 Spring City hosts the the annual Sanpete Classic Bicycle Race. The start and finish line is adjacent to the Osborne Inn. Cyclists compete in 46, 75, and 102-mile races on courses that wind through the beautiful, local countryside. This event is held in August. Call the Osborne Inn for contact information. Enjoy a leisurely ride on a bicycle. Tour the streets of historic Spring City or simply find where your wheels take you. Bicycle rentals are complimentary with your stay at the Osborne Inn. The Bike Shop provides rental bicycles for street terrain. For others visiting the area who would like to tour the town on a bicycle, rental fees are reasonable, and inquires and or reservations can be made at the Osborne Inn or by calling 435-462-9338. In 1956, Lester Hobert Chapman and family started the Cycle and Hobby Shop in Oscoda, Michigan. Evelyn Chapman, his wife, was his number one partner and associate. Evelynn Marie and Beth Jeanette, their oldest daughters worked in the store primarily in customer sales. Lezlee Danelle, their youngest daughter, helped during inventory and sales as well. Dane Michael, their oldest son, was trained in bicycle mechanics and repair. The Cycle and Hobby Shop was an official Schwinn Franchise. To qualify as such, Lester had to be trained at the Schwinn Factory in Chicago, Ill in all aspects of Schwinn bicycle sales and repairs. The shop also sold Cushman Motor scooters and Triumph motorcycles in addition to the many hobbies, model trains, model kits and other products one would expect in a hobby shop. The youngest child, Vaughn Lester also helped to run the store as he grew to an age of responsibility. 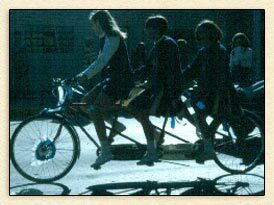 Early in the 1960’s Lester purchased one of the few Schwinn bicycles built for three. The only one Dane Chapman has seen in 50 years until a recent trip to Nantucket Island, MA, in 2005. The owners of the Nantucket Bicycle Shop had never seen another. When the owners of the Osborne Inn opened their doors in 2005, they also obtained license to open a bicycle shop, named the “Bicycle Built for Three” in honor of Lester Chapman and family and all of the memories of riding the Bicycle Built for Three in town parades and special functions.